LONDON (Reuters) - The bill for compensating families of those who died in the Grenfell Tower fire in London may be as low as 4 million pounds ($5 million), according to several lawyers and a Reuters analysis of how damages laws apply in England. The blaze engulfed a 24-storey social housing block in west London on June 14, killing an estimated 80 people in the country's deadliest fire since World War Two. 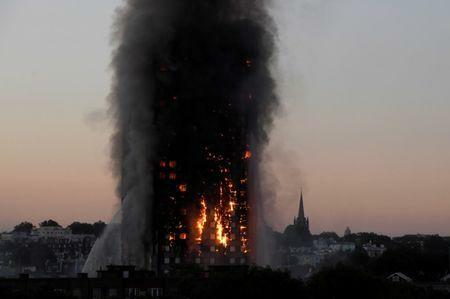 While similar disasters in the United States have led to massive payouts, any compensation for Grenfell would be far lower because English laws offer less generous damages and don't allow punitive claims, even if companies are found criminally responsible, said Brett Dixon, president of the Association of Personal Injury Lawyers (APIL). The four main firms that have been linked to the Grenfell fire - U.S. companies Arconic Inc. and Whirlpool Corp. and Britain's Harley Facades and Rydon Group - declined to comment on the size or calculation of potential payouts. The Reuters calculation of a bill of 4 million pounds is based on the compensation amounts stipulated in the Fatal Accidents Act of 1976, precedents set in previous cases and the individual circumstances of the 70 victims identified so far. Three personal injury lawyers have verified the methodology used by Reuters and said the estimate for the total payout is reasonable. If the courts find there was no unlawful behaviour by any of the companies or public bodies involved, victims will not be entitled to sue for compensation and would only get the financial support and temporary housing already provided by the government and public donations, personal injury lawyers said. "The British judicial system is not renowned for being generous," said Rebecca Thomas of law firm Duncan Lewis, which is representing some victims' families. "It's not about money for the families," said Tim Murphy, whose brother Denis, a disabled former painter who lived on the 14th floor, died in the fire. "Nothing can ease our pain, (but) I think it's quite insulting." The U.S. legal system sees punitive damages as a way of encouraging companies to behave lawfully, but British and European governments have taken the view this approach would put excessive burdens on the judicial system, businesses, insurers and state bodies that might be liable, some legal experts say. 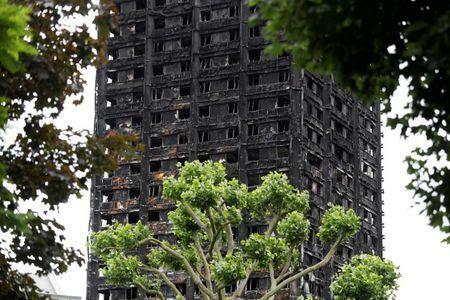 While APIL said the Grenfell Tower disaster demonstrated the inadequacy of payouts to victims, Duncan Fairgrieve, who has advised the UK government on compensation rules, said more generous payouts could also harm society. They could drive up insurance costs for all and lead to big claims against government bodies such as the National Health Service and the police, he said. "There is an affordability issue," said Fairgrieve, a Senior Research Fellow at the British Institute of International and Comparative Law. If the courts find someone was wrongfully killed, the claim categories are a flat 12,980 pounds per victim for bereavement, costs such as funeral bills, dependency damages where minors or dependent spouses are left behind, and property damage - all to be paid by the party found responsible. Under the 1976 law, only family members who were supported by those who died can claim dependency damages. Reuters has identified only five people who died leaving dependents who could definitely claim damages - on the basis they were financially dependent on the deceased. Daniel Machover, a lawyer at Hickman and Rose, which is representing some victims' families, also said he didn't expect there to be many claims. Most of the others who died in the fire were minors, single or elderly and did not leave family members who were financially dependent upon them. The biggest dependency payout will be for children who lost both parents, said lawyers representing some of the victims. One five-year-old girl, Tasnim Belkadi, lost her mother, father and all her siblings in the fire. Lawyers said she could get 300,000 pounds, based on a share of her parents' income and some childcare costs up to her 18th birthday. Her aunt, with whom she now lives, did not respond to requests for comment on the Reuters calculation. Grenfell plaintiffs can also claim expenses they incurred as the result of a death, such as the cost of a modest funeral. Heirs to the deceased could also claim the value of goods lost in the fire. The Association of British Insurers puts the cost of replacing the contents of an average three-bedroom home at 55,000 pounds. However, Thomas said Grenfell claims would probably be less than 30,000 pounds per property because compensation is based on the market value of personal belongings rather than replacement value, and the flats destroyed had only one or two bedrooms. Based on the victims' circumstances, Reuters has calculated the payout for dependency damages could be 1.2 million pounds, for property it could be 1.4 million and for bereavement it could come to 1.0 million. Other smaller claims for costs and loss of parental guidance take the total to 4 million pounds. Police said the fire started in a fridge freezer made by a subsidiary of U.S. company Whirlpool and have been investigating whether the tower's cladding, made by U.S. firm Arconic Inc., played a role in the spread of the blaze. Arconic said it was up to contractors to ensure its products were used correctly. Whirlpool said it was investigating the fire. Rydon Group, the contractor that oversaw the refurbishment when the new cladding was added, said it had complied with all regulations. Sub-contractor Harley Facades Ltd said it was not aware of any link between the fire and the cladding. 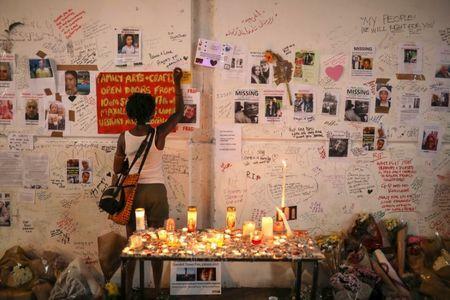 Fears among investors that companies linked to Grenfell could be sued for large sums in the United States hit their shares. Whirlpool's market value fell about $250 million on June 23 when police identified the maker of the appliance as Hotpoint, a brand owned by Indesit, which is a subsidiary of Whirlpool based in Italy. More than $1 billion was wiped off Arconic Inc.'s value after Reuters reported in June that internal emails showed it had supplied flammable cladding panels, knowing they would be used on the tower and despite warning in its brochures that only non-combustible panels should be used on tall buildings. Arconic's share price has recovered since its late June lows but it and Whirlpool's stock are below the levels they were at just before the fire, while the Dow Jones Industrial Average has climbed 7 percent over the same period. Awards against companies in U.S. courts have run into the tens of millions of dollars per family in some cases. In 1980, a fire blamed in part on inadequate fire safety measures killed 85 people at the MGM Grand Hotel in Nevada and injured hundreds. The hotel operator and contractors agreed to pay victims' families and survivors more than $200 million. Foreigners have often tried to sue U.S. corporations in U.S. courts over alleged wrongdoing abroad. However, judges have consistently ruled they lacked jurisdiction in such cases, saying adequate tribunals existed in the plaintiff's own country and that it would be hard for defendants to make their case in the United States. Machover at Hickman and Rose said he was considering whether Grenfell victims could bring a U.S. case on the basis that two of the companies involved were based there. But Thomas at Duncan Lewis and Leigh Day partner Jill Paterson were sceptical that U.S. courts would agree to hear Grenfell claims given the United Kingdom offers a reasonable forum for redress and because the U.S. companies were involved through European-registered subsidiaries. "I can't see any circumstances under which they could bring this in the United States," said Thomas. Arconic and Whirlpool declined to comment on the possibility of legal claims against them.